The plans are for 6 apartments, and although they do have parking, there is not enough for the number and size of the properties. There is also the issue of safety at the vehicular entrance this time. The UDP – Transport (Parking Guidelines) require two off street parking places per new residence with two or more bedrooms. The developers provision of seven spaces for four two bedroomed and two one bedroomed apartments completely ignores the intentions of the UDP. Not only do the developers wrongly state that that there is ‘’ample provision for a scheme that has the potential for low car ownership’’, the figure they give of 1.25 spaces per unit (so eight spaces needed in total) is incorrect. Ten spaces should be provided (two each for the two bedroomed properties, and one each for the one bedroomed ones). While it may be desirable to reduce car use and encourage the use of public transport and local shops, the reality is that most households have a least one car, with many having two. The planning inspectorate in her recent visit stated that it was highly likely that new residents would be car owners. The developers own Design and Access statement points out that they would be exceeding recommended number of dwellings per hectare. These density guidelines are based on typical Victorian terraced houses. Notwithstanding that these are classed as apartments, many typical Victorian terraced houses have two bedrooms and so 99 dwellings per hectare can still be considered considerably above the required density range of 40-60. The environmental impact of this new build is a concern. No indication has been made about the use of recycled materials (bricks and slates from the existing barn for instance). The plans do not include energy saving features such as solar panels. This contravenes UDP section BE5. Additionally the lack of garden space would contribute to the flooding risk. The current Creevela building allows us adequate daylight and privacy. The proposal says that the scale of new dwellings would.in scale with local buildings. It is clear from the drawings provided however that on the Parsonage Crescent side, they would exceed the height of number 56 which is immediately adjacent. They would also greatly exceed the height of the building they would replace because the current building is set well back from and below the road. The Parsonage Crescent facing side is in fact over 1.5 m higher than the previous proposal which was rejected. Placing the proposed buildings at the roadside on Parsonage Crescent would block much of the daylight from the front of our house and many surrounding properties. The new buildings would directly overlook our and other houses, removing privacy that we had before. This contravenes section H14 of the UDP. Placing the proposed new buildings at the roadside on both Parsonage Crescent and Parsonage Street creates a blind corner. Traffic from Parsonage Crescent onto Parsonage Street would have an obstructed view of traffic on Parsonage Street and vice versa. The speed of traffic on these suburban streets means such a plan would result in road safety issues. The design and access statement points out that building up to the pavement edge is in line with other properties in the area. However, it should be noted these properties were built at a time before mass car usage. Where a development is situated at a junction, it creates a road safety issue. There are numerous examples in the locality of dangerous junctions due to poor visibility. New developments should not add to their number. Indeed, this one would be a particular issue due to it being part of a ‘’rat run’ and the speed of traffic on these roads. Several accidents have been witnessed at this junction either by our neighbours or ourselves. The design and access statement is incorrect in stating that the archaeological survey showed no value in the current building. On the contrary, SYAS considers that even in its altered state the building and site is historically important and the building should be converted rather than demolished. The report for the previous application acknowledged that demolishing the existing building contravenes policy BE20. The existing building on the site is a barn that is over 200 years old. It predates all the surrounding roads and is one of the oldest buildings in Walkley. The South Yorkshire Residential Design Guide section N2 says the positive character of an area should maintain buildings of special architectural, historical or artistic interest. Demolishing the barn violates this guideline. 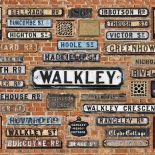 Under section BE18 of the UDP, Walkley is classed as an “area of special character”. BE18 states that the retention of buildings that contribute to character is expected and also that the loss of such buildings can adversely affect the special character of these areas. The developers are yet again using untypical and unrepresentative data to support their claims that the traffic situation would be an improvement on when Clear Line were using the premises. The traffic survey, submitted as part of the plan, did not reflect the problem parking times and issues. The survey was completed in July,2013 during the school holidays so many residents were away (including us). Taking snapshots at 09:00 (after residents have left for work) and at 17:00 (before residents have returned from work) gave a false impression of the number of cars parked on the street and the access issues. They are wrong in stating that there will be no significant highway issues and significantly less demand for on street parking than when the business was present. This ignores the fact that cars relating to the business were mainly parked during office hours when most resident’s cars were not. A further statement said that 13-18 cars in addition to the work vehicles in the yard would normally be parked on the surrounding streets and that there was regular activity from as early as 5am until 8pm. These figures are a gross exaggeration. Having lived here over twenty years, we do not recall being woken at 5am or a problem with vehicular activity late into the evening. This development will create more on street parking, in periods where parking space is already at a premium. Unless we were not at work or arrived home early we did not usually have a major problem finding a parking space due to Clear Line vehicles because their employees and visitors used the spaces freed up during the day by the residents. Despite Clear Line having vacated the premises at the end of 2013, major problems persist at weekends and during the evenings. Indeed, the planning inspectorate acknowledged this when she visited earlier this year as part of the appeal process. Additionally, she referred to a memo from Highways Development Control regarding the consideration of a residents’ parking scheme for the area being significant. A survey we conducted with local residents found that all respondents (18) still experienced parking problems. The suggested plans can only worsen this situation. Instead there could be several additional cars trying to park on roads that do not support the current level of parking. The South Yorkshire Residential Design Guide (section 1.5) references “unsatisfactory car parking” as a contributor to poor design. Indeed, the planning inspectorate referred to the problem of developments which contributed to congested streets and pavement parking as contravening Policy H14 (d) (UDP), as mentioned within the Written Ministerial statement of the 23 March 2015. UDP Policy H14 (d) requires that in housing areas, new development or change of use proposals be provided with safe access to the highway network and appropriate off street parking. The parking has already been discussed earlier, but we believe the vehicular entrance is not safe. It is situatated at the narrowest point of Parsonage Crescent on a bend. Visibility would be poor both for residents coming out of the proposed development and others driving along Parsonage Crescent, and create a hazard both for drivers and pedestrians. When vehicles pulled out of the builder’s yard when Clear Line were using the premises, we always saw someone else guiding them out. It would appear that Creevela are using another tactic, determined to demolish the building. About an hour ago, someone from Clear Line arrived and fenced off the building and put notices up staying ‘ do not enter’ and ‘dangerous building, keep out’. This is despite there being no mention in either the latest or the previous application about this. Spoken to Veronica Hardstaff just now. Something similar happened to an old house at the top of Highton street recently. There are several possibilities here. Can’t help but get the feeling Clear Line have done this to stop opposition and create an eyesore so their plans go through unopposed. Whether the building really is dangerous? I have my doubts there is anything seriously wrong, they just want rid. They may have deliberately left something to deteriorate, but I doubt it’s anything anywhere near big enough to condemn the building. The councilors are going to contact the dangerous buildings inspector about this. I’m sure if it was official they wouldn’t have hesitated to mention it in their proposal! Just all seems very underhand to me. This entry was posted on December 1, 2015 by Bill Bevan in News, Uncategorized.